ZANU PF supporters are allegedly chasing away political opponents from open spaces, car parks and home industries in Harare, saying they now control the capital after the party won five parliamentary by-elections last week. The reports came at a time several losing independent candidates complained that Zanu PF supporters were harassing them even after the ruling party won all the 16 Parliamentary by-elections countrywide. In one incident five supporters of independent candidate Herman Karimakwenda were beaten by Zanu PF supporters who invaded their car park business in Dzivarasekwa claiming they were now in charge of Harare. The skirmishes allegedly started on Monday after Zanu PF youths invaded the place and erected a banner written “Zanu PF youth league development area”. Tapiwa Hungwe, identified as the son of winning MP Omega Hungwe, allegedly fired shots to scare opposition supporters during the skirmishes. Karimakwenda alleged two opposition supporters were injured during the Monday clashes while three more were beaten on Tuesday. He said a police report had since been made. “The people attacked own the car park business and have been paying to council as per the lease agreement. 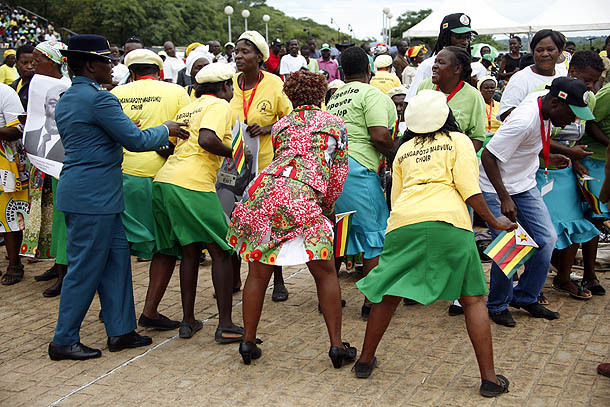 “Zanu PF people said they were taking over as they were now in charge,” Karimakwenda said. Both Hungwe and Tapiwa could not be reached for comment. Zanu PF was allegedly working to ensure its supporters benefited from the vending stalls that council and government were erecting in Harare with the Queen of Grace ZimAsset Trust getting preference to choose a suitable area they would want to operate from. Tinei Macheme, one of the victims of the Dzivaresekwa attacks, said they had since been invited to the Police Law and Order section to make a formal report. Farai Kuveya, who is the spokesperson of 10 independent candidates who participated in the by-elections, confirmed similar attacks in other areas. “We firmly believe that the ruling party is setting the tone for the much-awaited high stakes elections coming in 2018 and intimidation has already started with the aim of scaring people from opposing the ruling Zanu PF party,” Kuveya said. “We have had retribution cases in seven of the 10 constituencies that we were represented. Kuveya said some of the victims of Tuesday’s violence in Dzivarasekwa had to be rushed to private hospitals as they were badly injured. In other constituencies it was alleged that the winning Zanu PF candidates moved around carrying coffins during their celebrations. “This intimidation then makes it difficult, going into 2018, for opposing candidates to mobilise supporters as these things are done in broad daylight with the aim of instilling fear in the masses for standing up for something that is outside of Zanu PF,” said Kuveya. Heal Zimbabwe also expressed concern over continued cases of intimidation in Hurungwe West, days after the June 10 by-elections. “On 14 June, alleged Zanu PF youths invaded the residence of Francis Pasipanodya, who was a polling agent for Temba Mliswa and threatened to burn his house for supporting Mliswa during the by elections,” Heal Zimbabwe said. “The youths also threatened other Mliswa polling agents, Roderick Munayo, Phyllis Katemanyoka,Gabriel Nyamuronga and Edward Moyo in Ward 25, accusing them of also supporting Mliswa during the by-election. “The youths vowed that these five people were no longer allowed to stay in the area and threatened to burn their houses if they resist to vacate.